The double edge blade is 6 3/8 in. long and 420 stainless steel construction mirroring the actual piece used during trench raids. The plated handle offers knuckle guard and pointed tip. 11 in. overall. I was automatically exited when I bought this knife. It is very durable and I 've never had a problem when using it. The double edged blade cuts well, the knuckles punch well, and the "skull crusher"(pommel of knife) crushes well just as it does walnuts. I've never seen an actual 1918 trench knife but I've seen plenty of 1917 trench knives. As a suggestion to Bud K, you should start putting 1917 replicas on the market. 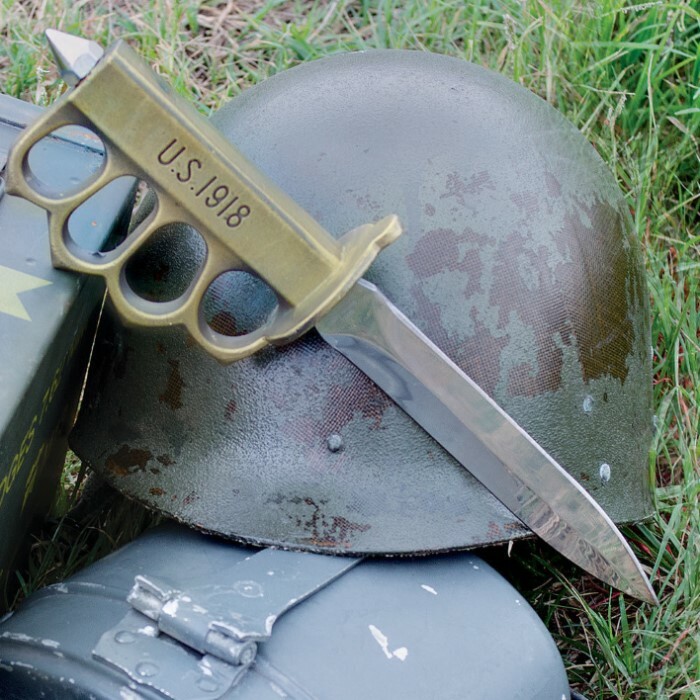 I received my WW1 trench knife replica this morning and I was amazed how close it was to the real thing. I've seen 4 and handled 2 real ones and the Bud K version is dam close. The originals had one of the 3 makers names on the brass handle; Henry Dotson & Sons, Landers, Frary & Clary, or Oneida Community. They were also made in France under contract to the US Army and those were marked Au Lion on the blade. All of the original knives were painted black, blade & brass handle, so moon light would not reflect off it in the dark. This blade is 6 3/8" vs an original 6 3/4". All in all the Bud K WW1 Trench Knife is as good as I'll get since originals are selling for $900 to $1000.00 and upward. Keep up the good work Bud K!! 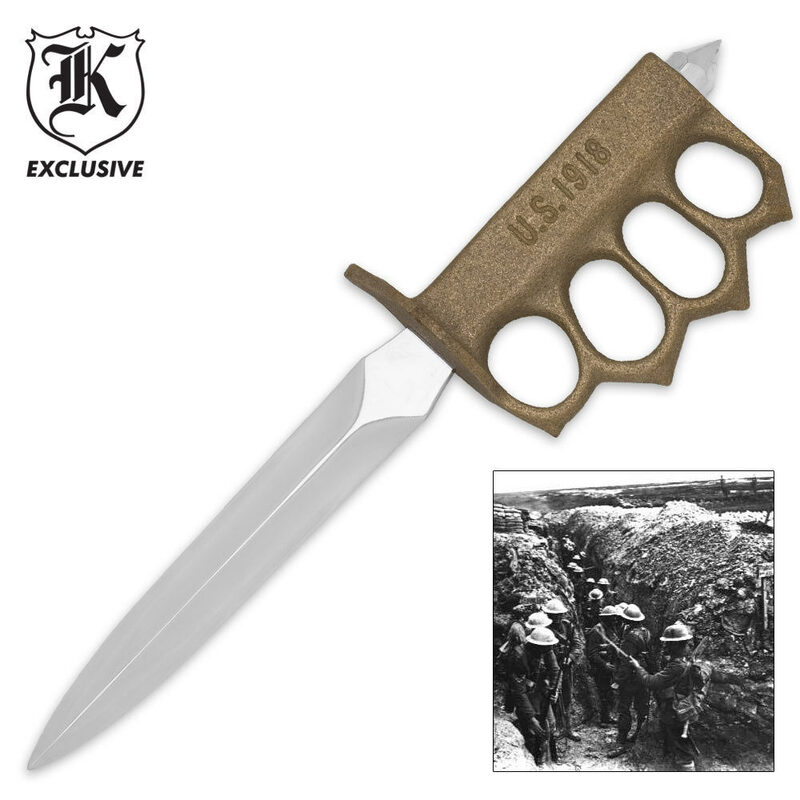 In WWI, the trench knife was intended to stab, punch and crush the enemy combatant in hand-to-hand combat. That was the sole purpose of the trench knife design for the time. Today, it will still serve the same purpose. It is not a hunting knife or a survival knife so if that is what your hoping for in the use of this knife, you will be disappointed. But if you're in a life or death situation and have the skills, this knife will get you through it. The sheath of this replica is not intended to do anything but protect the point and safeguard against accidental stab wounds. If you're looking to carry this knife, go to a saddle shop and have a durable leather sheath made for this knife as I did. I am pleased with this knife and would recommend it for those who know it's intent with the skills to use it as intended. The blade was a little scratched when I got it, but the knife is nice and heavy and just what I was hoping for. Shipping was really fast and everything was packed up well. Only complaint was that a sheath would have been nice, but it wasn't promised in the description so you shouldn't expect one. The knife itself feels solid and well made for the price. 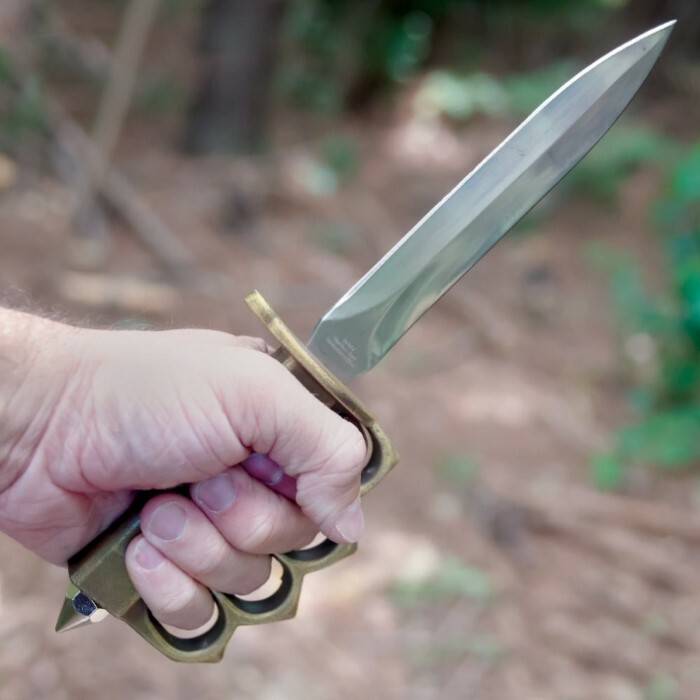 I'd recommend this knife if you're looking for a trench knife. It's crap. But take it down to 9.95 and I'll buy one. Also, don't waste your money on the sheath. It's green painted aluminum and doesn't have a belt loop. So, it's even more crap. They should give you a discount on the knife for being stuck with it. It's like putting a sheath on a butter knife sitting at your kitchen table. This is not a workknife, this is not a survival knife. It's a fighting knife. It's meant to stab, smash, and punch with. If you want a display piece for historical purposes, this is prefect it's almost exactly like the real ones. If you want a work knife, move along. If you want a survival knife, move along. I fyou want a knife for self defence, check your laws, if this is legal in your area, pick one up. Some people will say that the steel is bad, sure it needs sharpened frequently, but that's not a problem this is a stabbing blade, not a cutting blade, it's not supposed to be sharp, except for the point. This thing comes with a great point, I tested it myself and can ram it through plywood with a good solid lunge. The blade might come a bit loose, but the tang is threaded so just turn the nut at the back with a wrench till tight. It will do it's job of saving your life if you need it to and can use a knife properly. Sure it's material mean you shouldn't use it to process wood, but that's not what this is for anyways, is it? No it's for putting holes in people, and it will do that just fine. This knife is a total piece of junk. As soon as I took it out of the package the blade was extremely loose in the handle. The blade is not sharp at all. Its a real shame that this fine piece of american history is made in china. I guess you get what you pay for. It looks like a replica of a WWI trench knife should. However, my knuckles do not fit through the finger holes. Not even close. I have big hands, but not that big. The blade came extremely dull. There was no way to sharpen it without using power tools. A hand-held diamond sharpener would take years to put an descent edge on this blade. Would not recommend, unless it is for display only. Not a functional knife.